Keeping a lawn looking respectable is a challenge. Hostile climates, years of use, pets, irregular rainfall, invasions of lawn pests and weeds – or simply neglect – have left many gardens looking ragged. If your lawn suffers from acute soil compaction, constant weed problems, heavy organic matter deficiencies, you may want to remove the existing weeds and grass and start anew; or you have a new yard, playground or field where you want to plant grass. It’s a big job, but like a new floor or roof, it will last a long time if you do it right. For do-it-yourself homeowners, it could be challenging to lay an instant lawn. We’ve compiled some tips to help you with the process. There are two ways of planting a new lawn, seeding or laying an instant lawn. Seeding is less expensive and requires less work than laying an instant lawn, but a newly seeded lawn needs long-term care, and there are fewer times during the year when you can seed. Other seeds (couch grass & weeds) will also germinate and grow with your new grass. Instant lawn offers several advantages over seeds. It looks good immediately, and the lawn can be used much sooner than seeded lawns. Instant lawn is also better suited to sloping terrain where seed would be washed to low areas after the first hard rain. We will focus on instant-lawn-laying in this article. 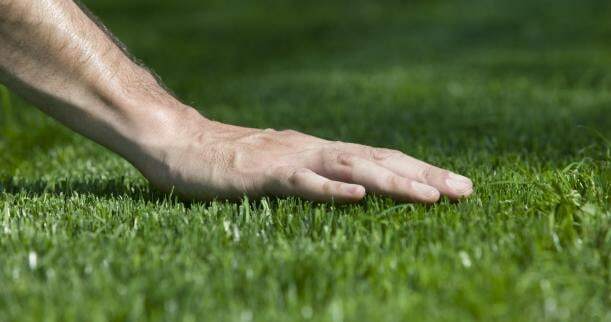 Some lawns (Kikuyu, Tifsport & All Seasons) can be laid at any time of the year. Thorough preparation is very important for the best results. Don’t arrange delivery of your turf before you have completely prepared the soil bed. 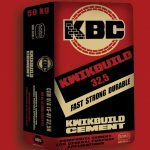 Preparation, as with most home improvements, is the key to success and the toughest part of the job. If you want to replant a large lawn, you may want to tackle it in sections. Redo the worst or most visible areas first. Do other areas the following year. It keeps the job manageable and makes watering more feasible for homeowners who do not have in-ground sprinklers. When replacing an old lawn, you may need to spray it with glyphosate (Roundup). This herbicide kills the entire plant and roots and ensures that weeds and couch grass cannot re-grow and infest your new lawn. Read the instructions on the pack carefully before you use any garden herbicide. When the old lawn has died, remove it. The easiest way to do this is to hire a turf stripper from your local hire shop or garden centre. 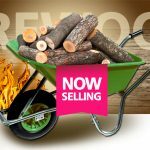 A depth of at least 50 mm (may vary due to soil type, rocks and other matter) of good Grass Factory Eco Organics landscaping mix or compost is recommended for grass to grow in. You may need to add landscaping mix to the area if you need to raise the height to surrounding levels. 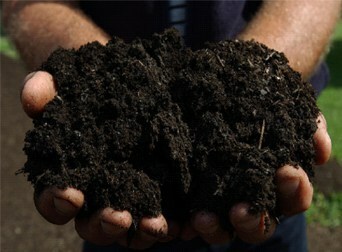 At this stage, it’s well worth thinking about working organic matter (Grass Factory Eco Organics compost) into your soil. For example, if you have very sandy soils, organic matter will add structure to the soil, and improve its ability to retain moisture and nutrients. If you have heavy clay soil, the addition of organic matter will help break up the clay and make it easier to work with. It will also improve the drainage. Try to avoid using peat as the source of organic matter; it is better to use Grass Factory Eco Organics compost. Dig the area over, removing any weeds, stones and building waste. Rake to a rough level. Then compact your soil whole area – this consolidates the soil, making sure that you are not left with soft spots. It’s worth taking time over this part of the job to avoid uneven settling of the soil later on. Level the surface and eliminate drainage problems by making the soil drain away from the house. 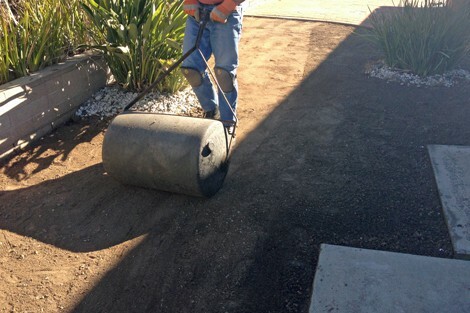 Roll the area with a roller to compact soil and to level the desired areas. Once you’re satisfied, water the ground and check for puddles. When the soil dries enough to be worked, move soil from the high to the low spots. Make sure you order enough lawn for your needs. Remember that wastage due to cutting and shaping is higher for irregularly shaped lawns, so you may need a bit more than you think. It’s well worth adding about 10% extra turf rather than find that you’re a few metres short at the end of the job. Turf must be laid immediately in the summer to avoid deterioration of the turf. As a general rule lay the turf as soon as possible after delivery. The sooner you lay it, the better the results will be. Dampen down the area where you are going to lay the turf. Do not lay turf onto dry soil, especially in the warmer months. It is ideal to dampen down the area about 4 – 12 hours before you lay the turf. You do not want it muddy when you go to lay the turf as it makes a messy, uneven job and harder work. Turf layed a couple of days after delivery in summer will be dead. Don’t let the sods/rolls of turf dry out. On hot days the unlaid stack of turf should be in the shade and sprinkled with water – do not soak, just a light misty spray. 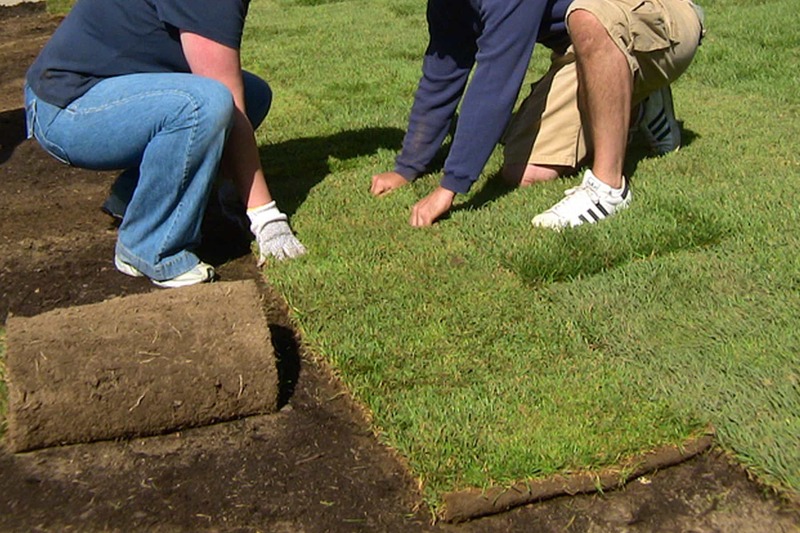 Have the lawn delivered to a shady spot and plan to install it on the same day as delivered. Don’t put a tarp or a plastic cover over the turf, as the turf will sweat. Find something that will breathe, i.e. an old bed-sheet or shade-cloth wetted with water. Start laying the turf along a straight side, butting the ends close together. On subsequent rows, stagger the joints like brickwork, making sure that there are no gaps (this helps control weed growth between sections). 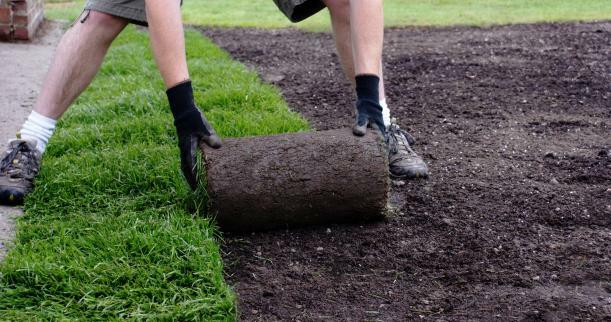 If you need to adjust the position of the turf after unrolling, always push it rather than pulling it to avoid stretching. Work from planks laid on the soil to avoid making footprints. Make sure that there is complete contact between the underside of the turf and the topsoil. If necessary, tamp or roll the turf lightly as you go along. Try not to leave any gaps between the turves, but if they do occur, they can be filled with topsoil and lightly firmed. Trim excess with a sharp utility knife, spade or sharp garden tool. When fitting together two pieces of lawn at an angle; lay one piece over the other and cut through both at once. Lift the top piece and remove waste below. When you approach the opposite side, add one full row next to your perimeter pieces. Then, roll out the next to the last row and cut pieces to fit. 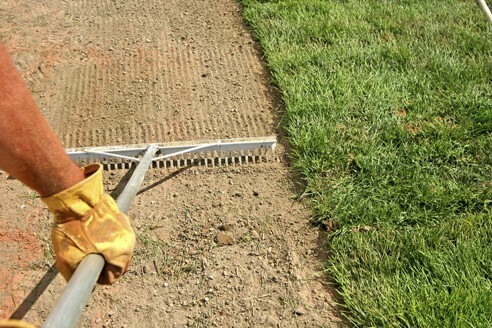 Use an edging tool to trim any curved edges or places where the lawn meets other obstructions. You should start away from your stack of the lawn if possible to avoid walking continually over the newly laid instant lawn. You may need to peg grass on sloping areas to prevent movement. Avoid leaving narrow strips at the outer edges, as they will not retain moisture as well at the edge, especially if not top-dressed. On hot days lay a section of instant lawn and lightly water then lay the next section, repeat until all the instant lawn is laid. On cool days all instant lawn can be laid at once. For drought-tolerant grasses (Kikuyu, but not LM or cool-season grasses) top dress or lawn dress with Grass Factory Eco Organics lawn dressing or topsoil (1,5 cubic meter per 100 square meters of turf). Apply a thick layer on top of the joins, narrow strips and any low areas. Apply a thin layer to the rest of the turf. Top dressing the turf holds additional moisture for the turf, therefore reducing the turf being shocked after harvesting and using your water more efficiently. Lawn dressing improves the establishment of the grass significantly. Within 1 hour of laying instant lawn roll it well to remove any air pockets and water thoroughly. 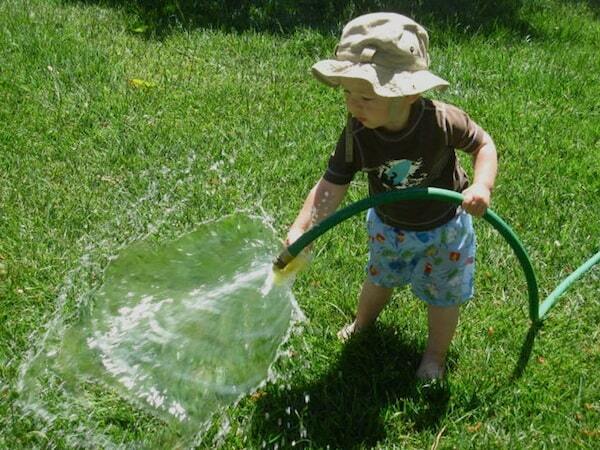 It is very important to start watering the turf as soon as you have laid it. Never let the turf dry out in the first 2-3 weeks, or until the roots have gone well down into the soil. Watering for the first two weeks is critical. When you water, make sure that the underside of the turf and the first 50mm of topsoil is damp. The best way to check this is to lift the corner of several turfs to see if the soil is damp underneath. Try to water little and often, rather than flooding the lawn, so that the soil does not become soggy. If you over-water, you may find it difficult to mow without leaving footprints on the turf. Another problem with overwatering is that it encourages the development of lawn diseases. Don’t water late in the evening because the grass stays wet overnight, and this too can lead to disease. Even after the critical first few weeks are over you may have to check that the soil has not dried up. 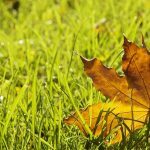 After all your hard work and hard-earned money spent – remember that lawn is a living product, and you will need to continue to water it regularly. Turf takes about six months before it settles in after you have mowed it a few times. Consider fertilising the turf with Grass Factory Eco Organics compost about 2 – 3 months after laying to give it that extra boost. You will find that during your first winter, the turf will lose more colour than what it will in the subsequent winters. When should I top dress or fertilize my lawn once it has been laid? You can apply compost once the first cut is done. This will help in filling gaps, helping correct levels and boost the growth of the lawn. Grass Factory Eco Organics compost can be used to fertilize in spring. When can I give my lawn its first cut? We recommend cutting it after two weeks, make sure your lawnmower is on its highest setting for the first cut. You can adjust the setting for subsequent cuts. We don’t recommend brush cutters on your lawn as it cuts it too low and exposes the rhizome. How often must I water my lawn? Water twice daily for the first two weeks, then daily after that. Once you see the grass is settling well you can water once a week or according to seasonal changes, use own discretion. Grass Factory was founded in 2004. We have planted almost 5 million sqr meters of grass since we started.